left: "Renty," Congo, on plantation of B.F. Taylor, Columbia, S.C.
middle: "Jack" (driver), Guinea. Plantation of B.F. Taylor, Esq., Columbia, S.C. In 1850 seven South Carolina slaves were photographed at the request of the famous naturalist Louis Agassiz to provide evidence of the supposed biological inferiority of Africans. Lost for many years, the photographs were rediscovered in the attic of Harvard’s Peabody Museum in 1976.
tool of oppression and a tool of resistance. Septermber 5, 1936 also known as "Falling Soldier"
"Forcibly pulled out of dug-outs." Jurgen Stroop (German, 1895 - 1952) "was a high-ranking Nazi Party and SS official during World War II. He was best known for his role in liquidating the Warsaw Ghetto and for his book-length account of the operation: a document originally titled The Warsaw Ghetto Is No More. Following Germany's defeat, Stroop was sentenced to death for war crimes by a US military tribunal during the Dachau Trials in 1947. He was later extradited to Poland where he was also tried and convicted of crimes against humanity. He was hanged by Polish authorities in 1952." The Diary of a Young Girl, published in 1947, includes photos of Anne and the people she hid with, plus a map of the secret annex in the house on Prinsengracht. On the cover was this haunting photograph taken by an automatic photovending machine in 1939. The first use of nuclear power was developed in 1942, in the Manhattan Project, with the building of the first nuclear reactor - called uranium pile. This project culminated with the release of two atomic bombs on the Japanese cities of Hiroshima and Nagasaki in 1945. The mushroom-shaped cloud reached 18 miles high. On August 6, 1945, the US president, Harry Truman, gave the order drop the atomic bomb called "Little Boy" on the city of Hiroshima. Two and 17/2 minutes later, the bomb exploded, killing and wounding more than a hundred thousand people. 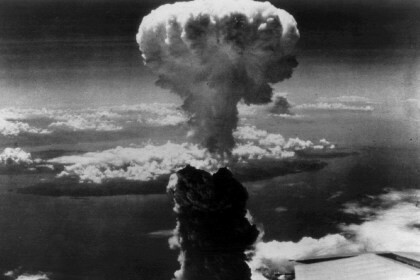 The value of the energy released by the atomic bomb dropped on Hiroshima was about 24 million kWh and the heat generated reached temperatures of 10 million degrees. Three days later, on August 9, another bomb called "Fatman," was dropped on Nagasaki. Forty thousand were killed and another forty thousand Japanese were injured. Due to the harmful effects of radiation, the inhabitants of Hiroshima and Nagasaki were victims of various health problems. There have been numerous cases of children born with genetic damage and many cases of leukemia, just to name a few. 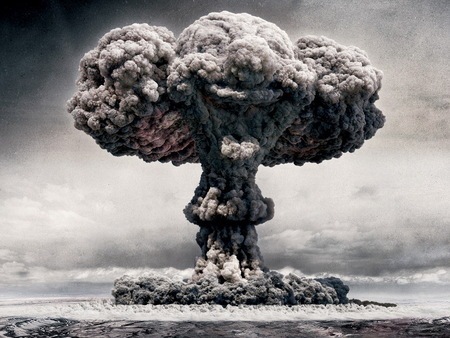 The atomic weapon with power equivalent to twenty thousand tons of TNT, was a thousand times more powerful than any of bombs known at that time. On September 2, 1945, Japanese representatives signed the Instrument of Surrender aboard the USS Missouri in Tokoy Bay - formally surrendering to the Allies and bringing an end to World War II. At the end of World War II, there was the beginning of an atomic and nuclear arms race between various nations in fear of being disadvantaged. The former Soviet Union, United Kingdom, France, China and later India, Pakistan and Israel conducted its own nuclear tests. . . This devastating image shows civil rights activist James Meredith moments after he was shot on June 6, 1966 while leading a civil rights march. Said march aimed to encourage African Americans to exercise their voting rights and this image shows him pulling himself across the Highway in visible pain. Right after being treated, he completed the march from Memphis to Jackson. In the image (above), wounded Marine Gunnery Sgt. 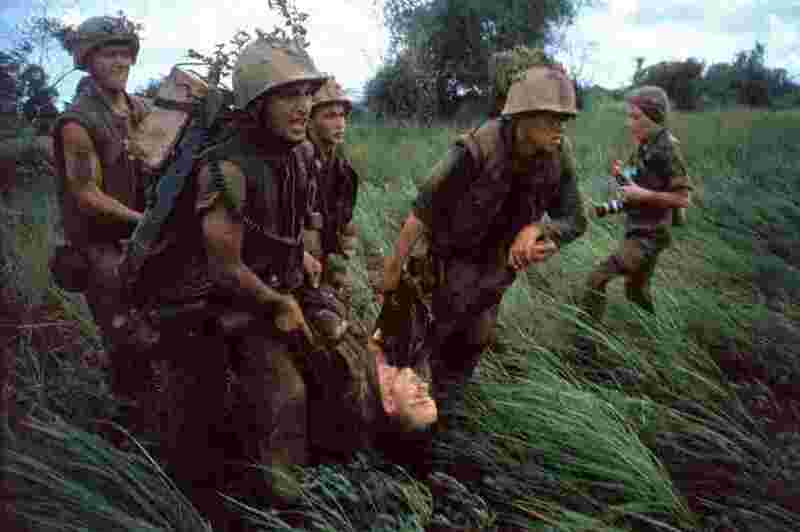 Jeremiah Purdie (center, with bandaged head) reaches out toward a stricken comrade after a fierce firefight south of the Demilitarized Zone in October 1966. The gesture demands the utmost compassion, while the landscape illuminates the apocalyptic nature of the conflict. 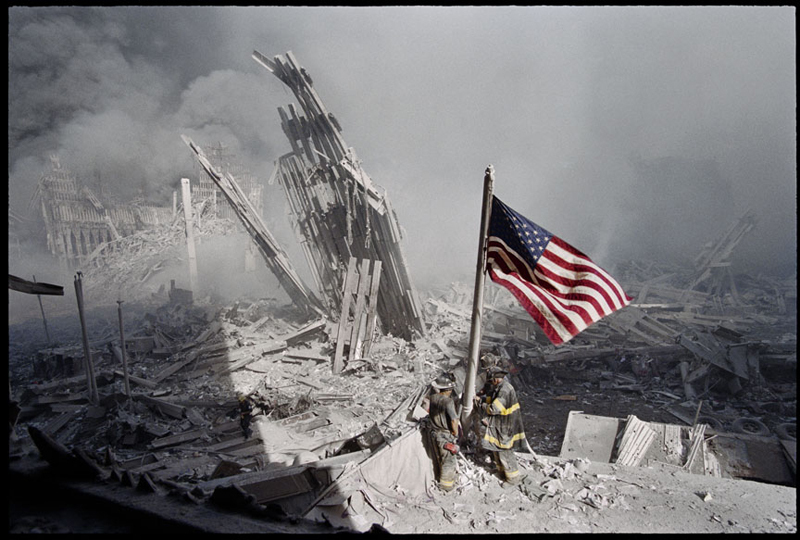 It's the paradox of war; finding evidence of compassion within a hellish circumstance. 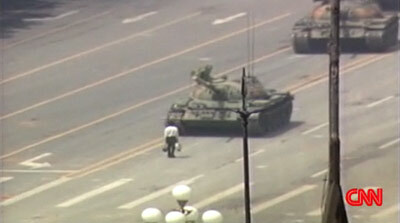 While the image itself is extraordinary, so is its story. As Ben Cosgrove (editor of LIFE.com) writes in his post, the magazine didn't publish the image in 1966 but five years later in February 1971: the occasion, an article devoted to Larry Burrows, who was killed earlier that month in Laos at the age of 44. The helicopter crash that killed him also took photographers Henri Huet of the Associated Press, Kent Potter of United Press International and Keisaburo Shimamoto of Newsweek. In the image below, four Marines recover the body of a fifth as their company comes under fire near Hill 484 in Vietnam, October 1966. At right is the French-born photojournalist Catherine Leroy (1945 - 2006); she was cropped out of the version of this photo that originally ran in Life. Dr King won the Nobel Peace Prize in 1964 for his powerful "I Have a Dream" speech - recited on August 28th, 1963 at the "March on Washington." Today Dr Kind is best known for his speeches, activism and especially for the laws he help get passed, The Civil Rights Act of 1964 and The Voting Rights Act of 1965. When the Igbos of eastern Nigeria declared themselves independent in 1967, Nigeria blockaded their fledgling country-Biafra. In three years of war, more than one million people died, mainly of hunger. In famine, children who lack protein often get the disease kwashiorkor, which causes their muscles to waste away and their bellies to protrude. War photographer Don McCullin drew attention to the tragedy. "I was devastated by the sight of 900 children living in one camp in utter squalor at the point of death," he said. "I lost all interest in photographing soldiers in action." The world community intervened to help Biafra, and learned key lessons about dealing with massive hunger exacerbated by war-a problem that still defies simple solutions. Photographer - Gilles Caron - was born in 1939 in Neuilly near Paris, France.Dubbed the French "Robert Capa," he proceeded to cover the Six-Day War in Israel, conflict in Vietnam and Biafra (Nigeria), the May 1968 student upheavel in Paris, riots in Northern Ireland, anti-Soviet demonstrations in Prague, and the Toubou uprising against the central government in Chad in 1970. On April 4 of that same year his meteoric career was cut short when he went missing in a Khmer Rouge-controlled area of Cambodia. When the Igbos of eastern Nigeria declared themselves independent in 1967, Nigeria blockaded their fledgling country - Biafra. In three years of war, more than one million people died, mainly of hunger. In famine, children who lack protein often get the disease kwashiorkor, which causes their muscles to waste away and their bellies to protrude. War photographer Don McCullin drew attention to the tragedy. "I was devastated by the sight of 900 children living in one camp in utter squalor at the point of death," he said. "I lost all interest in photographing soldiers in action." The world community intervened to help Biafra, and learned key lessons about dealing with massive hunger exacerbated by war-a problem that still defies simple solutions. Starving Child and Vulture, Kevin Carter, 1993 - The most haunting image on the most iconic images of photography, Kevin Carter captured the devastating famine in Sudan with a photograph of a toddler crawling to a UN feeding center while a vulture stalks her as prey. Carter won a Pulitzer Prize for his work but received harsh criticism for both the photograph and for not helping the child. A year later, gripped by the devastation and depression he had seen, Carter committed suicide. and the Washington, D.C. area. 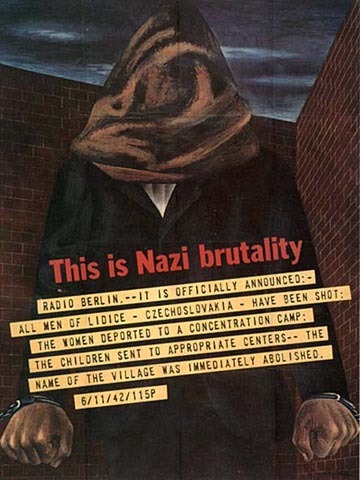 About Ben Shahn's This is Nazi brutality (1942) - "Lidice was a Czech mining village that was obliterated by the Nazis in retaliation for the 1942 shooting of a Nazi official by two Czechs. All men of the village were killed in a 10-hour massacre; the women and children were sent to concentration camps. The destruction of Lidice became a symbol for the brutality of Nazi occupation during World War II. " "Under their system, the individual is a cog in a military machine, a cipher in an economic despotism; the individual is a slave. These facts are documented in the degradation and suffering of the conquered countries, whose fate is shared equally by the willing satellites and the misguided appeasers of the Axis." "Many of the fear-inspiring posters depicted Nazi acts of atrocity. Although brutality is always part of war, the atrocities of World War II were so terrible, and of such magnitude, as to engender a new category of crime--crimes against humanity. The images here were composed to foster fear. Implicit in these posters is the idea that what happened there could happen here."  Vietnam: Old Photos Become Windows . . .